I lost quite a bit of west overnight, but have nearly managed to make it up today, plus quite a lot of south. Fingers crossed I don’t lose too much tonight! It’s slightly stressful as I seem to be in the middle of a really busy shipping area, so am keeping an eye on the horizon and the AIS. From the look of it I’ll be in it for a fair few days yet, so am preparing for lots of interrupted sleeps. For followers of Ratty, he finally made it out of his comfortable hammock today and ventured outside to have a look around. Ratty is my boat mascot and has been comfortably sleeping in his netting hammock since Monterey. He’s on a Bitcoin world tour, and after this voyage he will be continuing on his journey around the world with someone else. Like the original Ratty, I expect he prefers the calmer waters – maybe he’s really a river rat too?- and didn’t want to risk getting his lovely waistcoat splashed. Thank you to everyone who tried to help me identify the big blue and yellow fish under my boat – I’m still trying to work out what I think they are, based on all those suggestions, but am keeping my eye on them. This afternoon and evening there have been a couple of fish hanging around near me and doing a lot of leaping. They are about 1-2 foot long, with silvery-white stomachs going into darker blue silvery backs. Flat-ish but also fat. They’re jumping up to about 6 foot out of the water – kind of leaping up and then flopping back in whatever position they happen to be in (not all all like dolphins). I thought at first they were being chased by something, but I didn’t see anything. Maybe they just like jumping. Anyone able to identify them? May be just jumping fish? 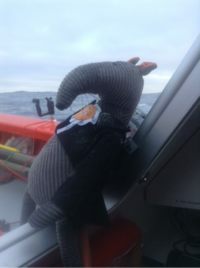 I think Ratty is best off in his hammock he doesn’t want to be washed over board especially if he has no life jacket! Porpoises? Can’t think what else. As Ratty did say: If you believe me, my young friend, there is nothing – absolutely nothing, half so worth doing as – simply messing around in boats! Hi Elsa. I think they could be mahi mahi. I saw lots of these on the Indian Ocean especially, but they do also hang out in the Pacific – and they love to jump. Up to about 10 feet in the air. I know you won’t be able to see this image but maybe Steve can describe it to you: http://bit.ly/1q9RY7H. We had a fabulous few days in Bristol – so many folks there thinking about you and wishing you well. Great to catch up with Steve too.